Sciblogs | Autism genetics, how do you copy? Subtitle: Recent research identifies many changes in copy number that may point to genes that cause or are associated with autism. In order to verify that important information has been conveyed over radio, the sender might ask ’how do you copy’ or, more briefly, ’how copy’ asking the receiver to tell the sender the information they received for confirmation. Copying genetic information accurately from one generation to another is important. Altered (mutated) genes, or adjacent regions that control how genes are used (regulatory regions), can interfere with the function of the affected portion of the genome. When geneticists talk about ‘copy number’, they are referring to a kind of change where the number of copies of a portion of the genome has been altered. Portions of the genome that have different numbers of copies in different people’s genomes are referred to as copy number variations, or CNVs for short. Copy number variations can be extra duplicate copies of a portion of the genome,* or deletion from loss of genetic material. Duplications and deletions can involve portions of the genome much larger than a single gene, or short stretches much smaller than a gene. The study just reported looks for large CNVs, big enough to include a whole gene or several genes (30-500 kilobases). For some diseases changes in just one or a small number of genes can explain the genetic causes of the disease. In the case of autism, while it is highly heritable (~90%), to date no one genetic change is found in a large portion of autistic people. Instead, it seems that we might expect a large number of different changes, each found in a small proportion of the total autism cases, that taken together might explain the genetic causes of autism. 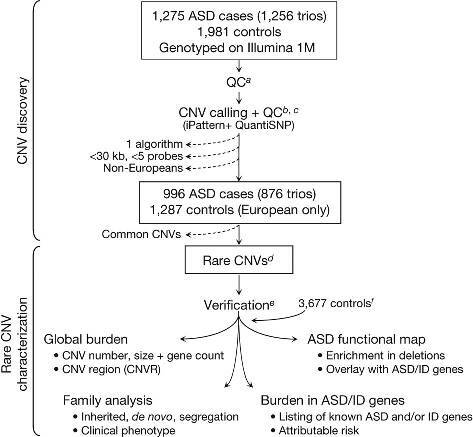 Pinto and colleagues in the Autism Genome Project looked for rare CNVs in 996 people with autism-spectrum disorder (ASD) and 1,287 non-autistic people, then compared those found in autistic and non-autistic people, aiming to identify CNVs that are associated with ASD. The research team looked at only people of European descent to try avoid genetic differences due to different racial populations. Having collected the rare CNVs, they looked at them a number of ways (see figure to left) including the number and size CNVs, their inheritance pattern in families and clinical symptoms, if they were near or in genes known (or likely) to be associated with autism, comparing the biochemical pathways the genes were found in. They found no statistically-significant difference in the number of, or estimated size of, CNVs between ASD and non-ASD people. The general character of the CNVs didn’t seem to matter. People with CNVs that might be expected to affect the function of a gene were more likely to be in the ASD spectrum than those without ASD; if a CNV was likely to have impact on gene function did seem to matter. 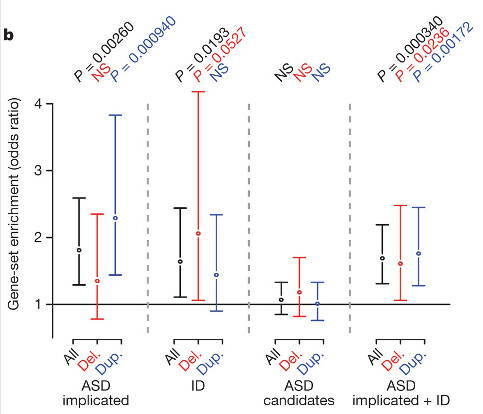 While statistically-significant, the correlation is not large: a 1.19-fold increase of rare CNVs overlapping genes in people with ASD compared to those without ASD, with a modest statistical significance (P=0.012). Studies looking for associations between rare CNVs and a disease or condition struggle to find statistically-significant associations. One way of thinking of this is that the data is thinly spread across many rare events, many of which will not be associated with the disorder being investigated. With this in mind, this is an interesting result. One thing that makes their results more interesting still, is that they found a higher proportion of people with ASD had CNV overlapping genes known to likely to be associated with ASD than people without ASD, consistent with the CNVs observed being associated with ASD. There are more highly-enriched genes with duplication CNVs overlapping genes implicated in ASD (first group to left) and deletion CNVs overlapping genes associated with ID (intellectual disability, second group from left). While there may be many different genes involved in autism, they may be associated with a smaller number of biological activities or chemical pathways, which might provide a clearer picture of the biology of autism. It may also point to biochemical pathways that might provide targets for treatment (e.g. drug development). To try link the CNVs to biochemical pathways and biological activities, they noted the function of the genes the CNVs overlap and used databases of biology pathways and biological activities to create what they called a ’functional map’ of autism. The initial functional maps suggest some directions for closer inspection. For example, they re-affirm previous observations that genes associated with the development (growth) and function of neurons (nerve cells) are involved in some cases of autism and point to specific biochemical signalling pathways and CNS (central nervous system) development. Readers will see that this involves considerable interpretation and perhaps wonder where all this is leading. The main value of this work, as I see it and speaking broadly, are in two things. It indicates that some rare CNVs are likely to be associated with autism and are worth closer investigation. That they observe statistically-significant associations suggests that closer examinations might turn up the wheat from the chaff. It provides focused directions for further research to follow. Complex genetic disorders are difficult because they provide many different small contributing factors, which are hard to fit together into a larger picture. It helps to be able to narrow the problem down to a smaller (although still large) set of genome regions that can be examined more definitively using techniques that (at present) can only be applied to one or a smaller number of genes at a time. The functional mapping approach looks to be showing promise in pointing to biochemical pathways or activities that can be investigated further. * Humans are diploid, we normally have two copies of each gene (one from each parent). There are quite a few things wrong with your argument. It can, however, be due to such things as better ascertainment, diagnostic substitution, etc. Or to be more blunt, in previous generations most individuals who would be considered autistic by modern standards were simply not diagnosed as such. There is no good evidence that the ACTUAL rate of autism, as opposed to the DIAGNOSED rate, has increased. Which may be accounted for entirely by coincidence and the vagaries of human memory. When scientists have looked to see if there’s actually a correlation between vaccination times and the observation of symptoms, they have not found one. In case it escaped your notice, a human being (even an infant) is very much larger than a bacterium or virus; it is therefore inappropriate to conclude that a dose of something which is dangerous to a bacterium or virus is similarly dangerous to a human. Given that there is no good evidence to even hint at a connection, but that such a connection has been extensively sought without result, it is not in the least bit reasonable to proceed with further such investigation. Errr, isn’t my immune system designed to “kill cellular life”? Should I find someone to remove it? Maybe someone in Tijuana knows a way to do it for a considerable fee.